Last weekend, while many of you were busy enjoying your candy and other gifts bestowed upon you by loved ones (or complete strangers, in which case STOP READING THIS AND RUN), the monsters were silently roaming about. Using the seemingly nonstop swarm of blizzards blanketing the country with snow and forcing any sane individual inside as cover, these hideous monsters crossed into our borders, hiked up their trousers, and began their silent march across the country, eager to dispense their own brand of rough justice. Justice you say? Justice for whom? Against whom? Well, that’s a good question to ask. Because when it comes to these cold-weather warriors, the justice attached to it can take so many forms, and none of them pleasing. So lock your doors, bar your windows, and begin praying. Because now, as the deep freeze settles in, the namahage have come to town with it. Snuggled in between Setsubun and Lunar New Year, the Namahage festival usually falls on or around February 15th, or typically “on the eve of the New Year” (localization be damned). While the festival has its roots in Northern Japan, particularly in Akita prefecture and the Oga Peninsula city, the monsters themselves are of the sort that would not have issue abandoning their traditional posts in order to deliver some serious “oni justice” to anyone who violates their deeply held convictions. Now, Kit has already mentioned how Setsubun was a time when the oni were driven out, in order for luck to take their place in the coming new year. Banish some serious mischief, and be rewarded with good fortune- thats never a bad deal. But the namahage aren’t those types of oni that need to be kicked out. 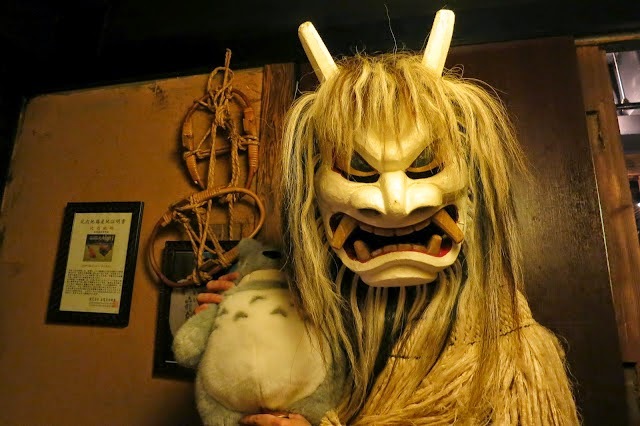 On the contrary, the namahage legend is one that would be more likely to be invited IN, so these creatures can indulge their fancy at the expense of the wicked, the whiny, and the disobedient. Their coming is a mark of good fortune, and they are on some level avatars of that same good luck that Setsubon promises. Unless, of course, you are one of the wicked, the whiny, and the disrespectful that need to be driven out. In that case, start packing your baggage, because the hammer is about the drop. Origins of the monster take so many different flavors. My personal favorite is courtesy of yokai enthusiast Matt Alt, who describes the namahage in his book “Yokai Attack!” as “taking their name from concept of the blisters that appear on the feet of the slovenly individuals who sit in front of a warm hearth for too long...a colloquial contraction of the words ‘namomi’ (fire blister) and ‘hagu’ (to peel).” These justice ogres would gladly invade the homes of those who were shirking their duties to sit in front of the fire by holding them down and ripping the blisters off their feet. Adding further insult to injury, the namahage would then shove a tool into the screaming victim’s hands, kick him outside, and force him to work, all the while dealing with the fiery pain surging through the open wounds the monster has inflicted. Hey, at least the ice and snow would staunch the bleeding and render the feet numb after a time. 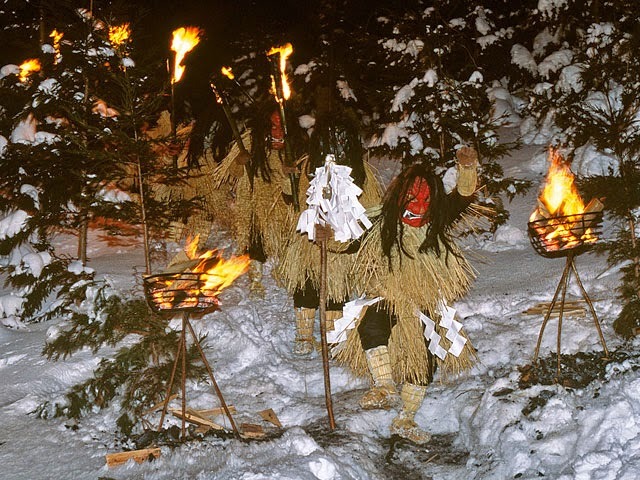 The power of community found throughout Japanese history and culture allows for beings like the namahage to exist, and even thrive, especially during the cold weather months. When entire neighborhoods live or die based around the actions of the people who live there, someone wasting their time because “it’s too cold” or “it’s boring” can have serious repercussions against those who actually do their duty as responsible citizens. Enter the namahage, and now those “slovenly individuals” have something powerful to fear, a creature far stronger- and more persuasive- than they are, calling direct attention to their misdeeds and condemning their selfishness. This legend has evolved numerous times over the centuries since its first reporting (which can be anywhere from Edo to earlier, crossing even the oceans itself and hinting at a possible Chinese origin...which given the influence of Buddhism and Confucianism isn’t that big a stretch). Slovenly people, presumably terrified of the monster’s modus operandi, eventually give way to the youngest among us- children unwilling to do their chores, or who whine when told to do something. These gaki (annoying/troublesome little brats), in desperate need of a smack upside the head from society, can look forward to the arrival of this ancient force, and the predictable amounts of punishment it can dole out to the unsuspecting, or the ignorant. Now imagine if you will the moment when this all becomes clear. Say your neighbor has been sitting inside, completely unwilling to clear that community driveway he shares with every other house on the block. Say this same neighbor ignores pleas for help, because two feet of snow isn’t worth his time, and he’s more than willing to use the front entrance and not drive anywhere rather than lift a shovel to help everyone else out. I’m thinking quite a few of you are picturing that neighbor right now. Especially those of you stuck in the Northeast, where snow has become the norm these past few weeks, and daily blizzards are not out of the question. Don’t worry, my brothers and sisters, help is coming. 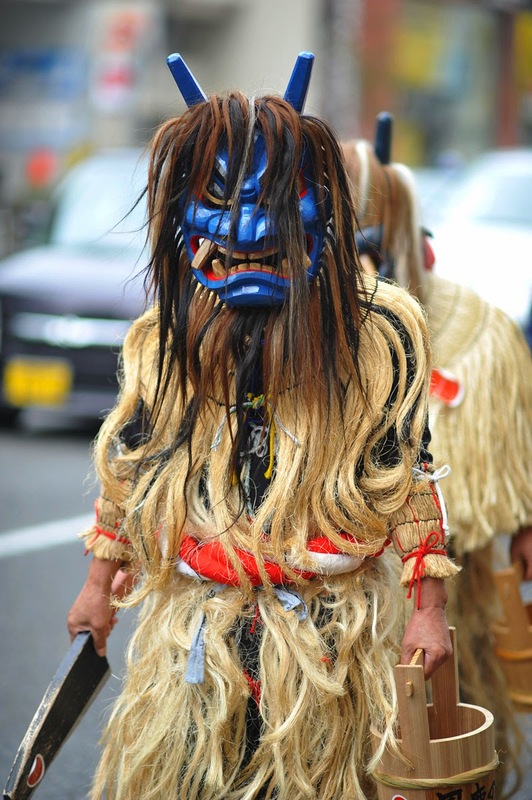 The namahage, dressed in his ceremonial “robes” and bright red face, pounds on this neighbor’s door. “Open up, you slag!” he shouts, repeating this over and over as he hears the frantic hurrying of said slovenly neighbor as he barricades the door and tries to hide. After a time, completely fed up with this instance of pure disrespect, the namahage and his fellows finally beat upon your neighbor’s door until it caves in, and invade the house. We may not be in Japan anymore, but if ever there was a crybaby out there, it’s the neighbor who never does anything for his community. So, while the snow continues to fall outside, these beasts of righteousness grab the neighbor, shove a knife in his face, and demand that he go outside and do something useful for the community. Under threats of violence and punishment, they manage to do what the entire community cannot, and force him to actually be a good neighbor for once. Driveway is cleared, cars may pass, and the greedy homeowner can spend the rest of the night huddled under his bed, praying that it was all some horrible dream. Now bear in mind, while this example was tailored to the machinations of Western laziness, the namahage in his home country is often seen as a terrorizer of CHILDREN. Replace the naughty neighbor with a young child throwing a tantrum, and you have reached an entirely new level of both shock and awe. Seriously, forget the boogeyman- just tell your whiny kid that the namahage is going to get him, and see how fast they quiet down. But all is not lost- for the best among us deserve a reward for our good behavior. And since it’s so close to Valentine’s Day, the namahage gives the rest of us a treat- some candy, to be enjoyed with those we love. Happy Lunar New Year, everybody. And pray that you’re on the namahage’s “nice” list!